When I think back to the period of time when I began lifting weights, I would label the 1960’s as the biceps era. 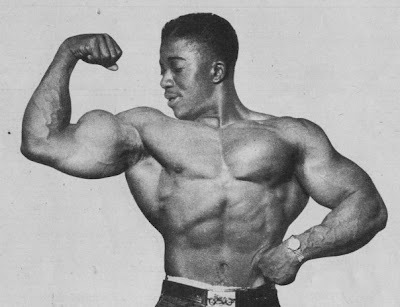 There were constant articles on increasing biceps size, and during those years bodybuilders were always claiming arm (biceps) sizes that were larger than they really were. It seemed each issue of a magazine had someone trying to outdo everyone else with a new, larger measurement. Finally, the biceps craze seemed to reach its peak when Arnold Schwarzenegger, through the magazines, claimed a 22” muscular biceps. Judging by the pictures of his arms in the magazines, his arms looked huge. Seeing them in person, and knowing that he weighed 270 pounds, the size was believable. Although the triceps are a larger group of muscles and considerably stronger, their location on the back of the arm causes them to be viewed after the visual impact of a large, muscular biceps. In the neighborhood I lived in, big arms were respected. This was especially noticed at the local high school. 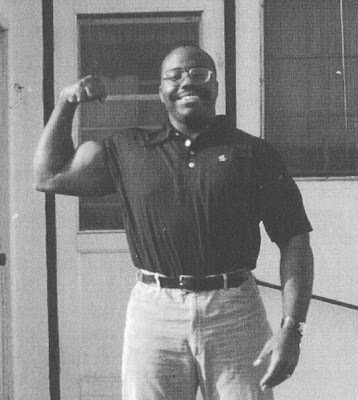 Several students had large, muscular arms, but none was larger or more muscular than my oldest brother’s. My oldest brother had polio, but he excelled in upper-body size and strength, eventually bench pressing over 300 pounds. In high school he was not only respected for his brawn, but also his brains, as he took on and conquered algebra, chemistry, Spanish, and other college preparation courses that were offered. Favorite exercises among the high-schoolers were the bench press, standing press and the barbell curl. These were some of my first exercises, and I would bench press and curl three days a week. Since I needed to gain bodyweight, and did gain 70 pounds in my four years of high school, my arms measured 18 inches by the time I graduated. I would use the summer months away from school to focus on increasing my size and strength. I trained in my garage gym and made up games to stay motivated and focused on what I wanted to achieve. For example, I wanted to increase my biceps size for every year of my age. It worked and it worked well, but as you can see, at some point an increase is no longer possible. Today I do not have 46-inch arms, but I did reach 22-inch arms at 22 years of age and 275 pounds bodyweight. The increase or decrease of bodyweight does affect biceps size and strength, and I would fluctuate from 275 pounds to 255 pounds, finally settling on a bodyweight of 272 pounds from 1981 to 1991. Muscular mass has been more important to me than size by itself. I always thought that muscles worked and developed to their maximum would lift more weight and for me, it seemed to work that way. At the first World’s Strongest Man contest in 1977 at Universal Studios in California, record-keeper David Willoughby measured my biceps with a metal measuring tape and they were over 21 inches. He then loaded an Olympic bar with 135 pounds and swung and heaved the weight in what he called curls, for a number of repetitions. The two main differences were how he and I performed curls. I had biceps size while he looked as if he never touched a weight. Too many lifters train the biceps as if they were a muscle group the size of the chest, quadriceps, or back. The biceps are a small muscle group that needs to be coaxed and encouraged a little at a time to grow in size and strength. Strict performance where the biceps is thoroughly worked must occur for growth to happen. In that way, sets need not exceed four to six, done two to three times weekly, with one or two exercises. Since the barbell curl and dumbell concentration curl are my favorite biceps exercises, I would do them three days a week with one day, 10 to 12 reps only; the next workout, 8 to 10 reps only; and the third day, 5 to 6 reps only. I would perform the concentration curls in the same manner. When I changed to two biceps workouts a week, I did 6 to 8 reps one day and 10 to 12 reps the other. Biceps growth seems to occur for me with a mixture of higher and lower repetitions. Eventually, I worked up to a 100-pound dumbell concentration curl for 5 reps, and a 225-pound barbell curl for 5 reps.
After one deadlift workout with Marvin Phillips and Terry McCormick at Samson’s Gym in Orange, California, I felt like curling, so I went to the dumbell rack and began standing dumbell curls (an exercise I did not do on a regular basis). I worked up to 110-pound dumbells in each hand for 5 reps. The importance of exercise strictness cannot be overemphasized. An odd lift contest was held at Venice Beach, California, in the summer of 1970. The odd lifts performed included the incline press and the Olympic barbell curl. I incline-pressed 335 pounds and curled 190 pounds. The curls were performed with the heels of the feet, the hips and the back touching the chinning bar post. Any space seen in these three areas deemed the lift “no good.” That was pure biceps strength. 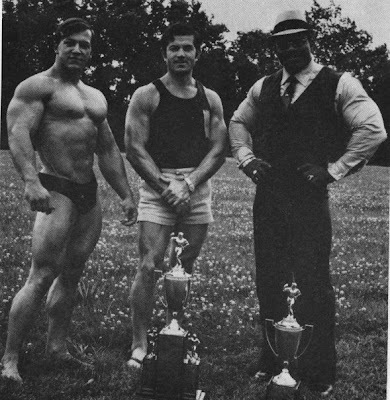 I won the contest and defeated the then top Mr. America competitor. Curling contests are no longer held in that manner, An EZ-curl bar is now used and the lifter sits against the wall with his legs extended. That is why some lifters can curl over 200 pounds. I wonder what they could do strictly in a full range curl. Another method I used was curling at different angles with the dumbell, my elbow supported inside the leg, or with the EZ-curl bar curl while I was in a half-squat position. Pausing at the top portion of the curls also worked the biceps thoroughly, and I favor that as an inclusion versus just bringing the weight up and down. By making the exercises more difficult, I became stronger, and with increased strength came increased biceps development. The different ways I curled were a result of observing lifters with well-developed biceps tearing them while performing deadlifts. I did not want that to happen, and carefully placing stress on the biceps seemed to ensure this did not happen.